Merle Haggard was an American singer, songwriter, guitarist, fiddler, and instrumentalist. Along with Buck Owens, Haggard and his band The Strangers helped create the Bakersfield sound, which is characterized by the twang of the Fender Telecaster and the unique mix with the traditional country steel guitar sound, new vocal harmony styles in which words are minimal, and a rough edge not heard on the more polished Nashville sound recordings of the same era. Merle was a country music pioneer and a legendary performer. Between the 1960s and the 1980s, he had 38 number one hits on the US country charts. During the 1970s, Haggard became aligned with the growing outlaw country movement, and he continued to release successful albums through the 1990s and into the 2000s. He received many honors and awards for his music, including a Kennedy Center Honor in 2010, a Grammy Lifetime Achievement Award in 2006, a BMI Icon Award the same year, and induction into the Nashville Songwriters Hall of Fame in 1977. Below is a list of the 10 best songs from Merle Haggard. Did your favorite make the list? 9. "What Am I Gonna Do (With the Rest of My Life)?" 6. "If We Make It Through December"
4. "Sing Me Back Home"
3. "Today I Started Loving You Again"
1. "The Bottle Let Me Down"
It was a great night for country music at the 51st annual ACM Awards, hosted by Country music stars Dierks Bentley and Luke Bryan, as the hit makers of the industry gathered to celebrate the best in the business. The Academy of Country Music Awards was held at the MGM Grand Garden Arena in Las Vegas on Sunday night, with performances by Dolly Parton and Katy Perry, Little Big Town, Miranda Lambert, and Keith Urban. 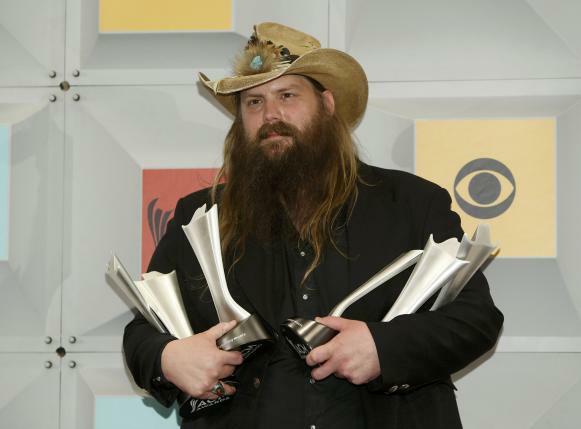 "Burnin' it Down" singer Jason Aldean may have taken home the top prize for "Entertainer of the Year," but "Tennessee Whiskey" singer Chris Stapleton was the night's big winner, taking home four awards in total, including "Male Vocalist of the Year."